WHITING, Ind., Jan. 4, 2013 /PRNewswire/ — As 2013 arrives, with it comes new calendars, new fashions and of course, new resolutions. Many of those new year’s resolutions will involve getting healthier. A new CouponCabin.com survey reveals that 65 percent of U.S. adults plan on making fitness-related new year’s resolutions this year. Eating healthier, getting in better shape and losing weight top the list, followed by exercising more at home and outdoors, eliminating certain foods from diets and going to the gym more. This survey was conducted online nationwide by Harris Interactive on behalf of CouponCabin.com from December 17 th to December 19 th, 2012, among 2,309 adults ages 18 and older. With so many people focused on improved well-being in the new year, they will be hitting the gym en masse this January and some current U.S. gym members aren’t thrilled about it. More than half (56 percent) of current gym members at least somewhat dread the new year’s resolutions crowd, i.e. the group of people who make fitness-related resolutions and crowd the gym, take up machines and leave scarce equipment available. Fifteen percent report they completely dread the new year’s resolution crowd. 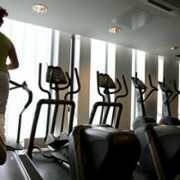 Even though the gym will be packed in the weeks following New Year’s Day, many will lose their motivation quickly. More than one-in-ten (11 percent) U.S. adults have signed up for a gym membership as a new year’s resolution and quit before the year was over, up from 7 percent who said the same last year. Women are more likely to quit in less than a year than men, at 14 percent and 8 percent, respectively. Eighty percent of those who have quit the gym within a year quit within five months, with 4 percent saying they quit in January and 14 percent quitting in February. For many people, their 2013 fitness budgets will remain in line with 2012. Nearly three-in-four (73 percent) who spent money on fitness-related expenses last year plan to spend the same amount on fitness-related expenses in 2013 that they did in 2012. Sixteen percent plan to spend more and 26 percent plan to spend less in 2013.